Apple Sauce Cookies?? What?? Just try them and you’ll be hooked, like millions of other folks who thought the same thing. 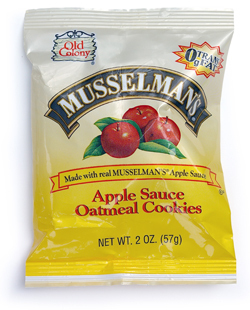 Our Musselman’s Apple Sauce/Oatmeal Cookie is one of the top items here at Old Colony. The scent of these cookies when opening the bag will bring back memories of your childhood and apple pies cooling on the window sill. The unique combination of apple sauce and oatmeal make this crisp cookie a favorite among kids and adults alike. 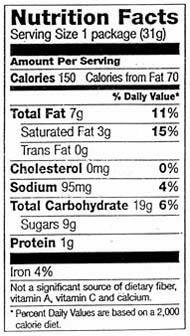 Ingredients: Enriched Wheat Flour (Wheat Flour, Niacin, Reduced Iron, Thiamine Mononitrate, Riboflavin, Folic Acid), Sugar, Vegetable Oil (Soybean, Palm, Canola), Oats, Musselman's Applesauce [Apples, Water, Eyrthorbic Acid (to protect color)], Water, Natural and Artificial Flavors, Salt, Baking Soda, Cinnamon.